Improving performance management models requires a comprehensive solution. Let's try a little experiment. Grab your keys and hop in your vehicle. Now, using only your rearview mirror, try to drive to your favorite coffee shop. This sounds ridiculous, but it's virtually the same approach that companies have been using for years to manage their employees' performance. Instead of considering what's ahead and how to prepare their employees to overcome it, businesses take a more punitive approach when they attempt to micromanage the past. While it is important to critique and shape employee performance when needed, a great system can't be built solely on that practice or it may impede performance. One of the biggest shifts in performance management in recent years has nothing to do with the company, the technology, or even the process. It has to do with ownership. Terra Argraves, talent acquisition and engagement manager at Hexagon, explains that the company's leaders were at first skeptical of the concept of giving employees ownership in the process. However, that is the critical first step before considering any other major change in the approach. The step of ownership takes some of the burden off managers—many of whom hate the performance review process—but that isn't all. It's also to help workers have a stake in their own career, performance, and growth. When you look back at your own career as evidence, which performance discussions were more engaging for you: The ones where you had a say in the process, the goals, and the development or the ones where it was all prescribed for you? 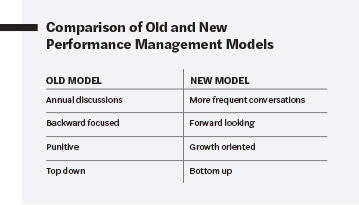 This is the core transition that must occur for the old and new performance management models to work (see the comparison table). If you attempt to fix the process without fixing this issue, your results will always be hampered by employees who feel like they don't get a say in their own growth. For several years, I've believed that there's an inherent connection among a company's performance management processes, its employee engagement, and its market performance. In 2017, I researched this for the Lighthouse Research Performance Management, Engagement, and Business Results Study. The results not only confirmed my suspicions that these components were linked but also found that there was a specific set of practices that high-performing firms are more likely to use. 14 percent more likely to focus on employee strengths. Let's examine five of these performance management practices. Recognition is often thought of as a separate component to performance management, but I'd argue that it's an essential component, especially in an environment where you have regular conversations about work. Taking the time to recognize and encourage positive behaviors will signal to the individual that he should continue those behaviors, and it serves as a signal to the rest of the workers what leaders expect. Dana Ullom-Vucelich is chief human resources and ethics officer for Ohio Living, an organization that provides living services to seniors. She believes that the practice of recognizing workers goes deeper than a simple pat on the back. Initially hoping to implement a recognition program that pushed up engagement scores, Ohio Living found that workers in areas with high recognition volume were delivering better business results: fewer fall risks and patient infections, for example. Ullom-Vucelich says that this led to more than 5,000 happier customers served every year. If your child makes a mistake, do you wait until three months later to let her know? Probably not. Yet, this is the way performance management has operated for decades. The term Autumn Spehar, HR director for Stout Advisory, uses is stale feedback. In the big picture, stale feedback helps no one because it's not actionable. Instead, giving feedback in the moment can help workers to address issues as they arise. This as-it-happens approach also helps to prevent that moment everyone dreads: showing up to a performance review meeting and waiting to get hit by a laundry list of all the things we've done wrong. In The Power of Moments, Chip and Dan Heath point out a research study where teachers graded student papers with two variations of verbiage. On one, they merely said, "This is feedback on your work." On the other, the grade was presented with this saying: "I have high expectations of you and know you can do better." Students could resubmit their papers for a second attempt, and the researchers found that students who received the second "expectations and assurance" response were not only more likely to resubmit their paper, but they also earned higher scores the second time around. In the workplace, approach performance feedback from the same standpoint, blending expectations and assurance to help workers perform at their best. Although giving feedback is a core competency for managers, many struggle to make it work. Maybe they're busy, they are unsure, or there's another reason—but it's a reality. Whatever the case, peers are usually more than happy to weigh in when given the opportunity. High-performing companies are more likely to have peer feedback mechanisms that enable employees to weigh in on other things happening in the business. What's interesting is that managers may not even be aware of an employee's performance on a project without other sources of feedback. In an interesting look at this concept, CVS Pharmacy conducted an internal analysis to determine how feedback flowed in and through the organization. It realized that certain individual contributors offered valuable, relevant peer feedback even though there was no requirement as part of their role. Because managers sometimes struggle with feedback practice, the company began using this predisposition to giving feedback as a signal or indicator of employees who may be good candidates for managerial roles. One of the biggest fundamental changes in how performance management works is around seeing it as a way to enable better performance with coaching and development, not just rating individuals on their past achievements. A variety of studies tell us that workers crave development opportunities, and wrapping that into performance discussions simply makes sense. At the end of the day, it's not the L&D or HR team that decides which employees receive targeted training opportunities for growth; it's the manager. One employer that takes this seriously is Chipotle. The restaurant chain hires management staff only from within the ranks of its current employees, which puts an emphasis on developing and growing new leaders constantly. In addition to being an incentive for workers, leaders who develop and coach other employees up into managerial roles receive a special development bonus of $10,000 for their efforts. Instead of leaving this development concept to chance, the company puts a budget in place to motivate leaders to make growth a priority. If you look at the old performance management model, it was often punitive, focusing on employees' gaps and issues instead of their accomplishments and strengths. The major challenge with this is it disproportionately affects the best workers. Think about it logically: Poor performers probably already know their weak spots and either haven't made moves to fix them or simply don't care in the worst of situations. On the other hand, a company's best people know they're good at their jobs and would have an easier time finding other employment if they tire of their manager's incessant focus on their blind spots and flaws. The quote that always comes to mind is one often attributed to Albert Einstein: "Everyone is a genius. But if you judge a fish by its ability to climb a tree, it will live its whole life believing it is stupid." In more practical terms, if managers only focus on the weaknesses of their people, these employees will be demotivated and possibly find another job. The question I'll leave you with is one that I ask of HR and talent executives every time I discuss this concept of performance: Does your company's current approach to performance management improve the performance and engagement of your people? Regardless of your answer, there are opportunities to adopt more of the components outlined above to continuously improve the outcomes of your performance management processes. One of the components of informal performance management that employers struggle with is the frequency of interactions. How often should workers be meeting with managers? If once a year is bad, is once a month better? What about quarterly? Weekly? While employers are challenged by this, the best companies look to their people for signals about what frequency works. And sometimes those people will surprise you. As with any discussion about talent processes from company to company, one size does not fit all. There may not even be one size that fits a particular employer. Vicki Williams, senior vice president of compensation, benefits, and HRIS at NBCUniversal, says that when NBCUniversal tried to do away with performance ratings across the business, some workers demanded that they be returned. In some business units, workers felt like they were not able to accurately measure their performance in the absence of those formal discussion and rating meetings, so some areas of the business brought the practice back. Williams says the firm now is careful to make decisions about a wide variety of factors, including talent practices, by first asking, "How does this make the employees feel?" The company is doing its best to ensure it delivers an employee experience that draws out the best of what workers have to offer. From a practical perspective of changing performance processes, a solid first step is to change the frequency of meetings to something unobtrusive, such as quarterly. What companies often find is that when workers and managers get into the habit of talking on a more regular basis, the conversations may wax and wane throughout the year, but the result is more interaction and discussion than ever. How Do We Handle Compensation Without Ratings? When talking with HR and talent executives about eliminating performance ratings, the first question is always predictable: How are compensation decisions made in the absence of hard performance metrics? Terra Argraves, talent acquisition and engagement manager at Hexagon, explains that there are a couple components in place. First, there are still performance metrics being analyzed to some degree, even if they aren't formally carried out annually in an official process. Her company's managers and executives still know which employees are performing among the more than 4,000 workers. Additionally, as in many companies, managers have some discretion over compensation allocations among their team members, and this doesn't change with the advent of a more casual, ongoing approach to performance management. In reality, informal doesn't equal immeasurable. I always advocate for making the process extremely clear for managers with regard to compensation, how budgets are set, and how decisions are made. If an employee has a compensation discussion with her supervisor, the supervisor should be able to carry on a conversation about those process-oriented components with the employee. The better equipped managers are to have those conversations in a clear and transparent way, the less likely it is that a company will run into issues with employees being in the dark about a "black box" approach to compensation. Bottom line: As a company changes its performance process, coach managers to also be aware of the compensation component, how decisions are made, and what responsibilities they have within the scope of the process. It benefits no one for there to be a surprise for workers or managers when the time comes for a salary discussion. Ben Eubanks is the principal analyst at Lighthouse Research & Advisory. He has authored dozens of reports, e-books, and more than 1,000 articles; maintains upstartHR, a blog that has touched the lives of more than 1 million business leaders since its inception; and hosts We’re Only Human, a podcast that examines the intersection of people and technology in the workplace. He has appeared on numerous influencer lists throughout the HR and recruiting space and is a sought-after speaker and influencer. Previously the HR director for an Inc 500-ranked global technology start-up, he currently operates Lighthouse Research & Advisory, a human capital research and advisory services firm. He works with HR, talent, and learning leaders around the globe to solve their most pressing business challenges with a research-based perspective tempered by practical, hands-on experience. His research focuses on cutting-edge practices in talent and learning technology, strategy, and innovation.